This course is designed for budget, program, and administrative technicians, analysts, and managers. It provides an overview of the federal budget process and focuses on how agencies can better their skills in formulating, justifying, and executing their budgets. See our Sample Agendas page for more. Audience Level Basic understanding of the congressional budget process or the legislative process or Congressional Dynamics and the Legislative Process recommended. Previous attendees include military officers, budget analysts, program analyst, mangers, SES, and employees of government contractors. Audience Size This program is most effective for between 20 and 75 attendees. Our selected client list includes clients who have purchased custom training, sent staff to our public programs and who have purchased our publications. Course Materials Includes course manual. Usually requires between 1/2 and 2 days. This program is usually held in Washington, DC. It can be presented anywhere in the world. 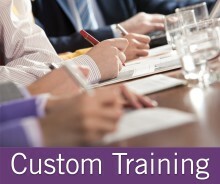 If you don't have enough people for a custom, on-site program, you can still train your staff at our public course. See testimonials about our budget program. Our faculty for this program all have more than 10 years' experience working with the federal budget.